In the construction business, each activity can make or break a project. The requirement of keeping an eye over a large project site and timely delivery of raw materials that are essential to the successful completion of the project, this can sometimes become too much to keep track of! To make it easier for their managers and employees to track progress and keep tabs over each aspect of the project, construction giant Fulton Hogan teamed up with UiRevolution to create a Mobile App to make this an easier experience. Asphalt Delivery is a Business App which focuses on delivering raw materials required in construction sites. With pre-stored information derived from Salesforce back-end UI managed by Fulton Hogan, Asphalt Delivery is a super easy app to use. Asphalt Delivery is an application which enables users to place an order for raw materials to be delivered to construction sites. It enables users to keep track of an asphalt trucks' delivery status to a construction site allowing users to access a live Apple Map image to track the delivery vehicle. Once you have logged in, the app opens on to an Apple Map image which will show your current location and a boxed framework to the left of the page. Trace Sheets would show your chosen location followed by the job number and date. 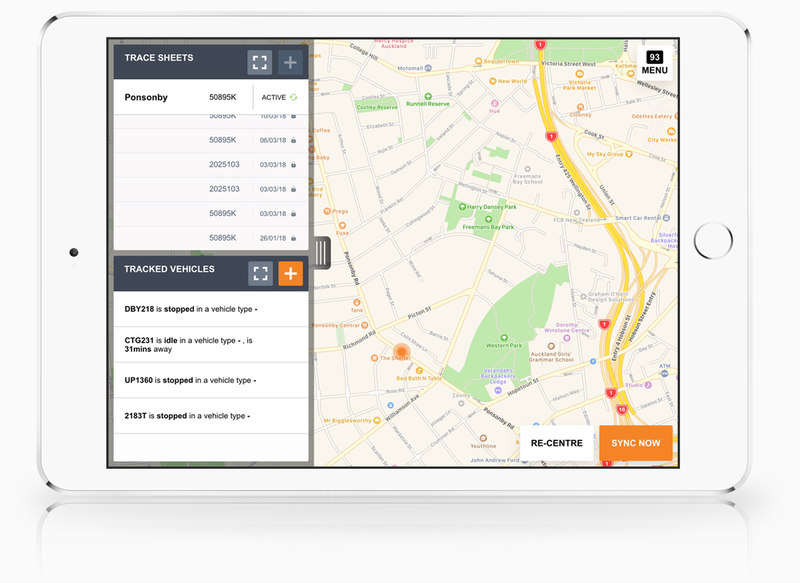 Below that, under the Tracked Vehicles tab, you can view the vehicles you have been tracking. You can also tap on the yellow + sign which enables you to manually enter a vehicle number you want to track. Once you have entered the correct vehicle number, you would be able to locate the vehicle on the map, whether its moving towards the drop-off location, the vehicle type, what kind of load it is carrying and the estimated time of arrival at the drop-off point (ETA). These options on the left can be hidden or collapsed if you tap on the small tab with three stripes. The other buttons on the main page include – MENU, RE-CENTER and SYNC NOW. NUMBER OF DELIVERIES: as per the chosen project. The option to re-centre allows you to come back to your location with a simple tap of a button without the hassle of navigating the entire map whereas SYNC NOW enables you to sync and save all the changes. You can create a new Trace Sheet tab by clicking on the yellow + sign. This would enable you to view a new page which contains several editable components such as the length of the load, area, total tonnes of material, average depth, etc. This Trace Sheet is editable, and you can put in the values as you go. The application makes sure the values are altered and calculated as you enter them. Asphalt Delivery is an app designed to make lives easier for those involved in tasks on a multiple projects across the country.